4th December 2018 Historical State Museum holds an opening ceremony of an exhibition "Russian North". In the north of the European part of the country, including territories of modern Vologda, Archangelsk, Murmansk Oblast’, republics of Karelia and Komi, the unique domestic life, unusual, incomparable atmosphere was formed, and various Russian folk artistic crafts were developing in it. This land was always famous for the skill of carving and painting on wood. Wooden tableware, furniture, house decorations were painted with bright fairy&dash;tale flowers, figures of horses and birds, lions and griffins, Syrin bird and mermaids, various genre compositions. Russian North is connected inseparably with the name of renowned Russian painter, book illustrator and stage painter I. Y. Bilibin. Some traditional embroideries that were brought from his travels to the north will be demonstrated for the first time ever. Wooden ladles, baskets, saltsellars, birchbark wares, spinning wheels will be presented at the exhibition, as well as the items from one of the biggest painting centre of XIX century that was situated in the area of Permogor’je on the Northern Dvina. The spinning wheel made by master Jacov Jarygin in the middle of XIX century distinguishes itself from other handiworks: on a light, almost white ground he depicted bright genre compositions — maidens gathered at the spinning wheels and a harmonist; a woman sewing; Russian troika and a cart; tea&dash;time at a round table with a samovar and a teapot; here are also figures of a lion and a unicorn together with master’s favorite birds set against the luxurious floral ornament — "travka" that is peculiar to the XVII century. National costume is the brightest and most distinctive element of all cultures. For historical reasons Russian North was the only place where the costume of pre&dash;Peter epoch was preserved and prevailed. It consisted of traditional sarafan, shirt, pinafore and waist&dash;band and was enriched with different finery. The most valuable part of the costume were headdresses, especially wedding ones. The exhibition will demonstrate women’s national costumes and headdresses from Olonets, Kargopol, Archangelsk governorates of XVIII— the middle of XIX century. 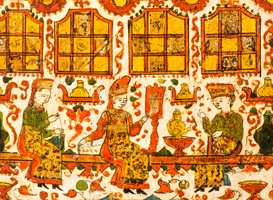 The art of the Russian North existed and developed in close connection with religion. The exhibition will show you the fullest carved "list" of St Nicholas Mozhaisky’s image mentioned in annals. Northern icon painting was influenced by Novgorod very early, since XIV&dash;XV centuries, then by Rostov the Great, Vladimir and lastly Moscow. Since XVI century local artistic traditions began to shape up, and monasteries, for example, Solovetsky and Antonievo&dash;Siysky, became large centres of icon painting. Veliky Ustyug was the main centre of "northern niello" — curious type of etching. Ware, chests, tobacco and jewellery boxes were popular among the silver items made by masters of this town. In these workpieces, as well as in other folk crafts, the influence of art styles prevailing in XVIII&dash;XIX centuries is visible. For example, for XVIII century pastoral scenes and landscapes, apparently borrowed from the fashionable book illustration of these times and actualized by local masters, are customary. At the exhibition you can see a gold&dash;covered silver tray made in 1837 with Vologda cathedral church and the inscription "Principal town of a province Vologda M:Ivanch Zuev" on the bottom. Along the edges master Zuev located niello garlands of leaves and flowers, in the corners there are floral baskets. Russian North is famous not only with its masterpieces of decorative and applied art, but also with monuments of Old Russian literature. Beautiful artistic decorations of manuscript books, miniatures, initials turn literary texts to the real treasures of art. string(98) "Дверка от шкафа. Россия. XVIII в. Береза, окраска, роспись"
string(139) "Прялка. Российская империя, Вологодская губ. 1781 год. Дерево, роспись, окраска"
string(172) "Кукла. Крестьянка северной губернии. Российская империя. Начало XIX в. Дерево, резьба, раскраска"
string(237) "Блюдо "Времена года". Русский Север. Вторая половина XVII в. Дерево, железо, левкас, темпера; токарная работа, роспись, золочение"
string(124) "Икона-крест. Россия. Выговская пустынь. XVIII в. Дерево, резьба, окраска"
string(69) "Распятие. 1775 г. Дерево, резьба, окраска"
string(194) "Скульптура Николая Чудотворца в киоте. Псков. XVII век. Дерево, резьба, золочение (позолота), роспись, окраска"
string(205) "Расправа Мещеринова с соловецкими старцами. Неизвестный художник. Вторая половина XIX в. Бумага, чернила, темпера"
string(167) "Икона. Огненное восхождение пророка Илии. Русский Север. Начало XVI в. Дерево, левкас, темпера"
string(188) "Икона. Преподобные Зосима и Савватий Соловецкие. Поморье. Последняя треть XVIII в. Дерево, левкас, темпера"
string(112) "Икона. Воскресение. Русский Север. XV в. Дерево, левкас, темпера"
string(152) "Икона. Рождество Христово. Вологодские земли. Середина XVII в. Дерево, левкас, темпера"
string(227) "Блюдо "Времена года". Русский Север. Вторая половина XVII в. Дерево, железо, левкас, темпера; токарная работа, роспись, золочение"
string(57) "Cabinet door. Russia, XVIII century. Birch, dye, painting"
string(82) "Spinning wheel. The Russian Empire, Vologda governorate, 1781. Wood, painting, dye"
string(105) "Doll. Rural woman of northern governorate. The Russian Empire, early XIX century, Wood, carving, painting"
string(115) "Dish “Seasons”. Russian North, late XVII century. Wood, iron, gesso, tempera; lath work, painting, gold plating"
string(80) "Icon-cross. Russia. Vygovskaya Pustin’, XVIII century. Wood, carving, painting"
string(42) "Crucifixion. 1775. Wood, carving, painting"
string(110) "Sculpture of Saint Nicholas in kiot. Pskov, XVII century. Wood, carving, gold plating (gilding), painting, dye"
string(115) "Mescherinov’s carnage with the monks of Solovki. Unknown painter. Second half of XIX century. Paper, ink, tempera"
string(103) "Icon. The Fiery Ascencion of Elijah the Prophet. Russian North. Early XVI century. Wood, gesso, tempera"
string(107) "Icon. Venerable Zosima and Sabbatius of Solovki. Pomorye, last third of XVIII century. Wood, gesso, tempera"
string(67) "Icon. Resurrection. Russian North, XV century. Wood, gesso, tempera"
string(88) "Icon. Christmas. Territory of Vologda. The middle of  XVII century. Wood, gesso, tempera"